I have a thing for old televisions and cabinet stereos, and by a narrow margin, old televisions are the lesser of two evils. With evil, in this case, being measured in square feet. Perhaps that’s why I have two old televisions and try to remain content with only one cabinet stereo. This was gutted in 2008 or so and has had a few machines installed into it over the years. Its current incarnation is an old P4 tower sourced from Free Geek Vancouver. 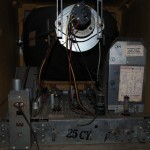 An LCD is mounted in place of the old CRT and a custom smoke-gray plexiglass surround hides the (slight) size mismatch. It looks pretty good, works well, and as a bonus it also drives an old ceiling-mounted projector when I feel like putting up the screen. 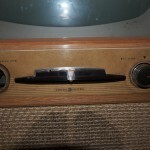 The gut-and-replace projects are feeling a little easy, though, and the recent troubles I’ve had in finding 8-track players for another project have left me wondering how long antique tube-based TVs will be available, particularly in working condition. 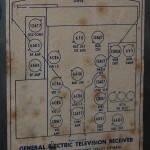 Plus I have a project in mind that requires a working black-and-white TV. 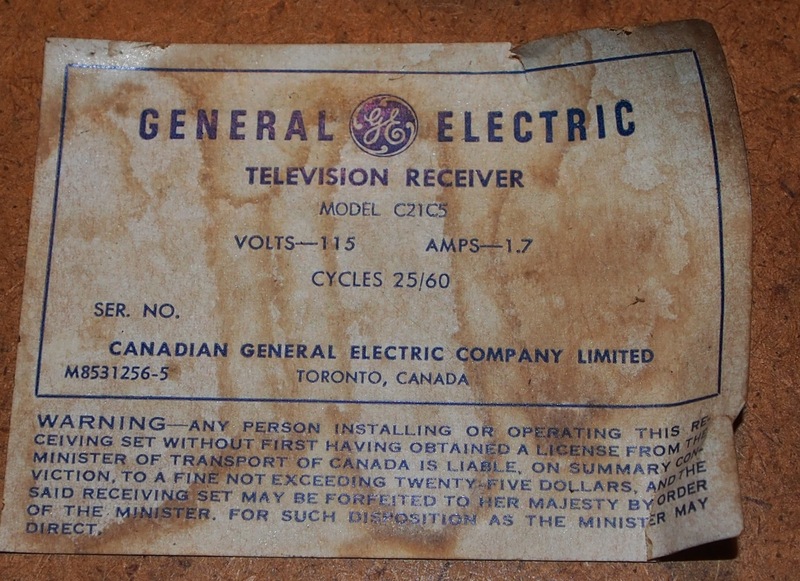 WARNING — Any person installing or operating this receiving set without first having obtained a license from the Minister of Transport of Canada is liable, on summary conviction, to a fine not exceeding twenty-five dollars, and the said receiving set [sic] may be forfeited to Her Majesty by order of the Minister, for such disposition as the Minister may direct. I have inquired about getting a license from The Honourable Lisa Raitt and will report back. 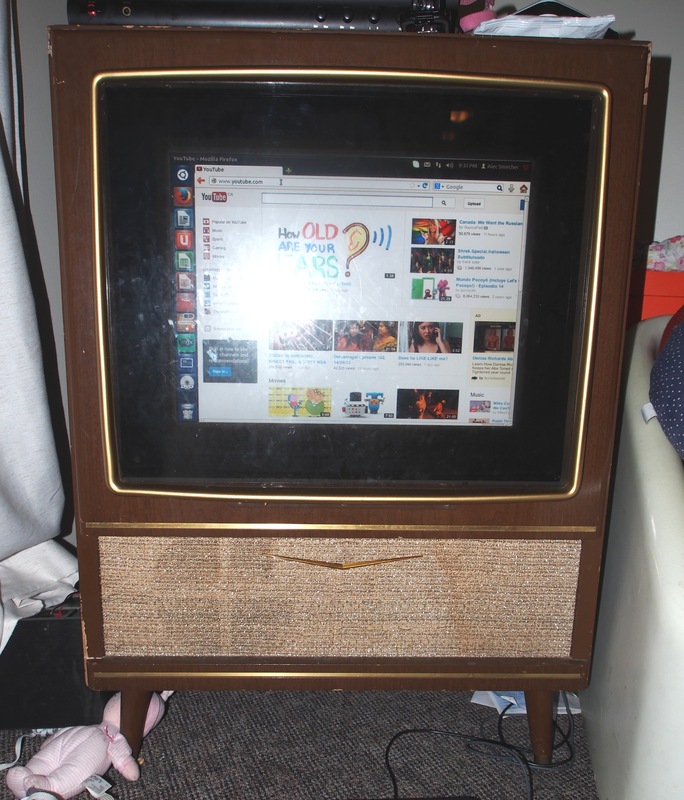 This is one television the Queen is not going to get her filthy hands on. A cleanup crew hired to clear out the place — which operated sporadically as a deli and general store before closing for good more than a decade ago — found $950 in old $100 and $50 notes hidden under a rug. But it was the caretaker who made the greatest discovery, stumbling on a bag containing a whopping $400,000 stuffed inside a bedroom closet. Also found in the house was a suitcase containing old German passports dating to the 1940s and ’50s. I’ll bet there’s more than a few stories behind that. 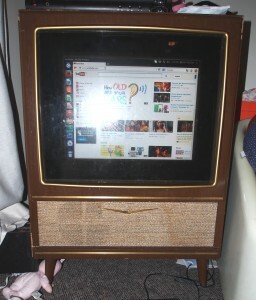 This television was apparently rescued off the curb before the junk truck could take it away. I hate to think what else was whisked away to be chucked in the landfill. Anyway, it’s beautiful but awfully large, so it eventually hit Craigslist and came to me. First I tried to identify what it was. Unfortunately the model number (C21C5) is a Canadian model number and corresponds to just about nothing. I found a photo of a very similar American model but haven’t been able to get the model number from the owner. Finally I found it here: a 1952 21C202, with Stratopower chassis. Sadly, it doesn’t work — but it feels close. 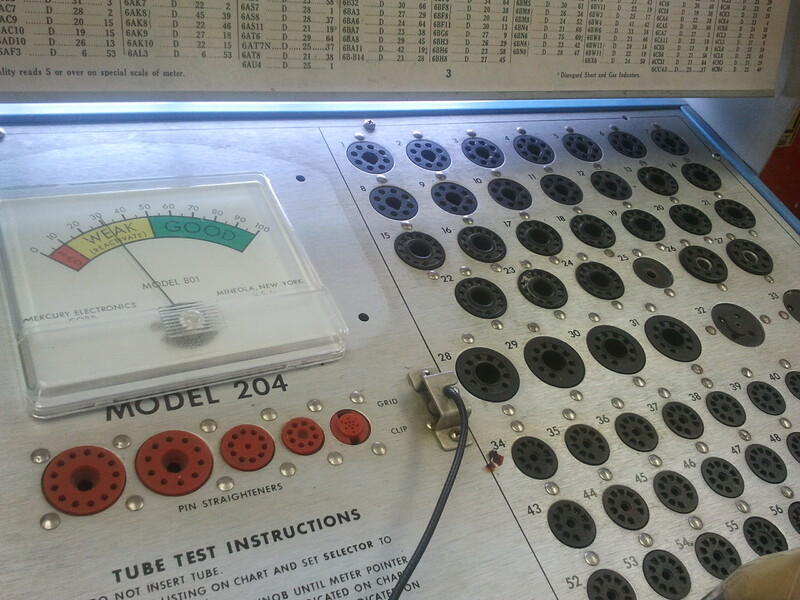 I’ve hooked up an RF modulator and gotten audio, meaning the tuner and audio circuits seem fine. 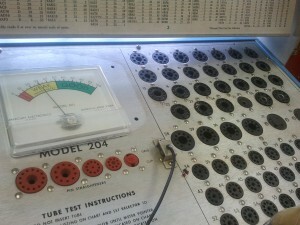 All the tubes light and have tested OK — courtesy of the tube tester at Main Electronics: I love those guys. They let me stick around after hours so I could finish testing, and even stocked the couple of tubes I needed to replace. Remarkably, of the 21 or so tubes in the thing, only 2 were bad. The problem seems to be in the horizontal scan circuits. 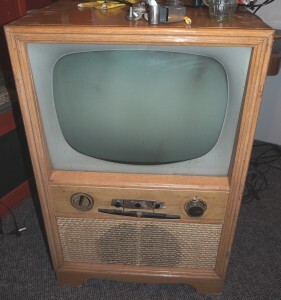 I can hear the 15khz horizontal scan frequency, but my Introduction to TV Repair (thank you Vancouver Public Library) insists that it’s still the most likely problem. 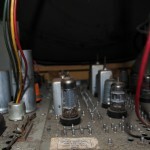 I’m aware that old capacitors are frequent culprits in antique hardware; I’d hate to have to re-cap the whole thing (it’s all point-to-point wiring) but it may come to that. 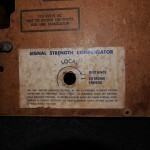 I found an original Stratpower chassis repair guide and eagerly await its arrival. More to come, including (eventually) what I intend to do with it. But for the moment, check out the guts. 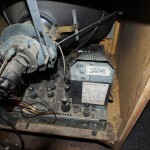 The only date I found on the actual unit was 1962 — when the 10-year warranty on the picture tube expired. 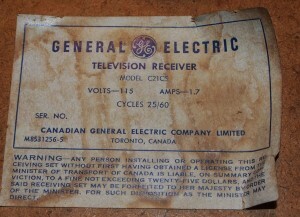 It is unlikely — but possible — that this TV was made while George VI was King of Canada. Isn’t the TV’s horizontal scan frequency in the teenager-mosquito-ringtone range? I think it’s 15khz; that’s not all that high, but I remember when I was a kid many of my classmates couldn’t tell whether or not TVs were on by listening. I can still tell as soon as I get into a room, despite playing drums a lot. That’s good news: I’ve always been afraid that I would lose the ability to tell when CRT televisions are turned on when I get older. 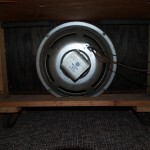 Also, I’m not an expert in television acoustics, so do you know why one cannot tell whether a rear-projection TV or a computer monitor is on by listening? Is it because they have higher resolution and thus a higher horizontal scan frequency?